In this deepening economic crisis, growth strategies may seem less important than defensive strategies and cost reduction. But not to the CEO's of most healthcare organizations. Stephen Forney is the guy CEO's have turned to, to go find the money. His talent for digging out dollars and doing so quickly has established a national reputation. His track record includes multiple success stories increasing net revenue and EBITDA by double-digits. You've got to love his current job title at Ardent: VP Margin Development. Stephen graciously lent his insights to Healthcare Technology News. HTN: The article talks about about three different stallers or stoppers that are signals that new growth strategies should be employed: 1) Shrinkage or shift in the profit pool; 2) Direct threat from a competitor with a new business model; 3) Growth simply stalls out. Which of these represent the greatest impact or threat to most healthcare organizations? STEPHEN FORNEY: The scenario representing the greatest impact or threat to most healthcare organizations is that growth simply stalls out. This situation can have myriad causes. An organization can have constraint issues (i.e., not enough resources to handle growth), a community can see demographic shifts/declines, or broader economic trends (e.g., the current recession) can curtail growth. HTN: What are some of the unique innovations in Customer Service that you think are particularly powerful in today's market? STEPHEN FORNEY: Single call scheduling and pre-authorization programs are particularly powerful customer service enhancements in today’s market. There are many steps required to make sure a patient is ready for service (especially in a managed care environment), but most of these steps should be transparent to the patient. Information gathering should be complete to ensure proper scheduling/authorization/billing and minimize additional patient contacts. Best practice organizations are allowing on-line scheduling from patients and physician offices which greatly minimizes the back-and-forth phone calls typical in this process. HTN: Building practice services based on best practice capabilities is an easy lever to throw. Whenever HCO's integrate, the first thing to get integrated is laundry services and maybe IT. Many times that's as far as it goes. Which practice services are most successful and most likely to generate a meaningful return? STEPHEN FORNEY: The most beneficial services for HCOs to integrate are patient financial services (PFS) functions, materials management, transcription/coding, and managed care contracting. These areas can most easily benefit from economies of scale in an operational perspective and from increased leverage in a negotiating perspective. Additionally, internal /external best practices are easiest to adopt across organizations in these areas due to their non-clinical nature. Finally, these areas represent significant control over an organization’s cash flow, which provides an environment in which even small improvements can yield large returns. HTN: You argue that healthcare leaders "need to review service margins for individual physicians, practices and departments to identify patterns and see where imporvements can be made." What are some of the resources that can help healthcare executives to integrate margin analysis into their physician and service line management? STEPHEN FORNEY: The primary resource that would help healthcare executives integrate margin analysis into management practice is a formalized process for decision making that includes margin analysis. While advanced information systems can certainly assist in measuring physician/service line margins, too much emphasis is placed on such systems when trying to make financial decisions. There are many organizations with relatively unsophisticated information systems that have well developed processes for margin analysis. These organizations simply place an appropriate emphasis on margin analysis as a decision making tool. Additionally, contract management and product line analysis systems are now readily available at multiple price points and levels of sophistication. Excepting the smallest facilities, most organizations would benefit from investing in such systems. HTN: Are many HCO's aware of the opportunity with Transfer DRG underpayments? It seems like such low hanging fruit. Can you walk us through this strategy? STEPHEN FORNEY: The opportunity with Transfer DRG underpayments does not enjoy a high degree of awareness with HCOs. In summary, Medicare reduces payment for any inpatient stay falling under a transfer DRG when that patient is transferred to a PPS post-acute facility before they have incurred a length of stay equal to that DRG’s GMLOS minus one day. These patients usually are transferred to a SNF or Home Health environment. However, a significant percentage of patients transferred to these environments do not receive the designated level of care within the window defined in the Medicare regulations (three days). The payment for these patients should be the same as if they were discharged home. Medicare does not have an edit in place with the fiscal intermediaries to disburse underpayments relating to such transfers (they do have an edit for overpayments). This annual impact can easily run into six to seven figures for medium to large health systems. HTN: Assisting patients to apply for Medicaid coverage eligibility is a public good and a great revenue producer. However, there is a growing hospital payment shortfall relative to costs for Medicare and Medicaid. Properly executed, this strategy exacerbates this public policy issue. Where do you think this is headed? STEPHEN FORNEY: I think this could definitely contribute to a higher Medicaid spend than might exist otherwise and this could be problematic for a state that cannot generate appropriate revenues to cover the additional expense. In all likelihood, states would compensate over the long term by modifying Medicaid benefits or raising taxes. HTN: You argue that HCO's can increase noncontract claims revenue by 100%, which is 10-15% of total claims volume. That's real money that the payers are not going to give up on easily. What's your experience negotiating to eliminate third party discounts from payer contracts? STEPHEN FORNEY: My experience with eliminating third party discounts is that it is possible and that “rental networks” have little leverage with providers. Such networks do not steer business and, therefore, have no ability to affect a provider’s volumes. In effect, the discount being given is being listed as “in-network” with a payor. Given the absence of steerage, this benefit is of dubious value. The sole value of these networks is to provide a framework for multiple small volume insurers to pay a provider. This warrants a small discount (5-10%) if coupled with appropriate prompt pay language. However, all such agreements should be at the same discount. Third Party Administrators (that represent small volume insurers) will have access to multiple networks and will access a provider under the most advantageous terms. HTN: Motor vehicle accident and workers' comp claim requirements can differ by state. You suggested that sufficient resources be allocated to ensure this is handled correctly due to the substantial volume represented by these claims. What kinds of technologies and services are available to support this state-by-state claims management? STEPHEN FORNEY: There are numerous outsource vendors that provide expertise in managing MVA and Worker’s Compensation claims. Utilizing a vendor to provide this type of service can be cost effective for some organizations. The alternative is to develop appropriate expertise in-house by hiring experienced, or training, personnel. HTN: You identified 5 common reasons for denials including lack of pre-authorization, ineligibility, bad information including codes, uncovered services and claims not timely. There are services and software to address these issues. So how can denials management continue to be in such sorry shape across the healthcare spectrum? STEPHEN FORNEY: Denials management remains problematic across the healthcare spectrum primarily because healthcare systems do not place sufficient emphasis on securing complete, accurate information prior to the provision of patient service/discharge. Most of the issues relating to denials can be resolved by developing solid Patient Access processes (including a QA function) centered around pre-registration, pre-authorization, and insurance verification. In addition to the processes, success requires absolute commitment from Senior Leadership in a facility/organization. Frequently, Senior Leadership inadvertently supports a breakdown in these processes by placing too great an emphasis on throughput at the expense of gathering complete information. HTN: You've found that periodic auditing and the use of a "belt and suspenders" approach - - a second contract module - - can help to drive recovery of managed care underpayments. In your experience, is this sustainable? STEPHEN FORNEY: There is a small level of sustainability with a second contract module. Presumably, an organization would modify the configuration(s) in its first contract module after finding recoveries with a second contract module. Each successive iteration would decrease the impact of the second contract module. However, it would continue to provide a check on new/revised contracts and is relatively low cost. HTN: So where to begin? It's sure to be situational. But where have you had the greatest success? STEPHEN FORNEY: I have had the greatest success by focusing in on margins by product line and looking at managed care processes for opportunity. These areas represent the potential for significant savings / incremental revenue in a short period of time. They also require an in-depth review of processes within an organization that can lead to other significant areas for margin improvement. CMS referenced a 2007 article estimating that wrong site errors might occur “once each year in a 300-bed hospital' and "surgeons who work on symmetrical structures may have a 1 in 4 chance to be involved in a wrong-site error during their careers." A 2006 study reported finding these errors in 1 of 112,994 operations. Finally, the 2006 AHRQ study reported that these errors "are extremely rare and major injury from them is even rarer." To put the study's definition of "extremely rare" in perspective: the FAA's operational error rate (i.e., allowing two planes to be too close together) is 31% better (1 in 149,074 operations). Effective immediately, Medicare does not cover these events, which apply to hospitals, doctors and "any other health care providers and suppliers involved in the erroneous surgeries. " This is a change in coverage limitations from some other 'never events', which had applied to hospitals only. CMS, in an apparent moment of dark humor, stated that "instructions for processing such claims will occur at a later date." Yet CMS is quite serious about this, as only 11 states prohibit wrong-site billing. Clarke J, Johnston J and Finley E. Getting Surgery Right. Annals of Surgery. 2007;246:395-405. Kwaan M, Studdert D, Zinner M and Gawande A. Incidence, Patterns and Prevention of Wrong-Site Surgery. Archives of Surgery. 2006;141:353-358. Final rules were published on January 16 for ICD-10 codes and the related electronic transactions. The relaxed compliance dates offer no reason to relax. The health care industry will switch to ICD-10 on October 1, 2013. Encounters and discharges occurring before October 1, 2013 will use ICD-9, and those occurring on or after that date will use ICD-10. The final rule suggests that compliance activities (gap analysis, design, development, internal testing) should begin in January 2011. The fundamental driver for ICD-10 is financial - - the inability for ICD-9 to support the growing number of high-priced medical procedures. For more on this, see "More Painful than an Insect Bite? ICD-10 Cost-Benefit for Healthcare Providers". ICD-10 will be used where ICD-9 is used today. More specifically, ICD-10-CM (Clinical Modification) will be used for diagnosis coding and ICD-10-PCS (Procedure Coding System) will be used for inpatient hospital procedure coding. CPT and HCPCS codes will continue to be used in an ambulatory setting. Allow the United States to compare its data with international data to track the incidence and spread of disease and treatment outcomes..."
ICD-9 includes separate codes for medication errors and other external causes of injury, which are reported separately from the actual condition. Under ICD-10, information about medication errors and external causes of injury will be embedded in the code for the condition. Therefore a single, more informative code will provide a ready source of information to help medical professionals prevent medical errors and improve quality of care." PQRI and other quality measures will also be affected by these standards. CMS makes it clear in the final rule that there will be ICD-10 updates to the quality measures in regulations to follow. CDC and CMS are good sources of information on ICD-10-CM and ICD-10-PCS guidelines and cross-mappings, even including a mapping from ICD-10 (international) to ICD-10 (U.S.). The HIPAA electronic transaction standards also get a refresh with a compliance date of January 1, 2012. The 5010 version supports the ICD-10 code sets and applies to claims, remittance, eligibility, referrals/authorization, and other transactions . In addition to ICD-10 support, 5010 changes "include structural, front matter, technical, and data content improvements... (and) addresses ... unmet business needs including ... providing on institutional claims an indicator for conditions that were 'present on admission.' " The target date for covered entities to complete internal testing is December 2010, so testing among trading partners can begin January 2011. Facilitates the billing of multiple ingredients in processing claims for compounded drugs." A Medication subrogation standard is adopted with the same compliance date as the other transactions for all but small health plans (the subrogation process allows Medicaid to recover payments from a payer that has primary financial responsibility). Eight years after the original HIPAA rule was issued, use of electronic transactions remains stubbornly and abysmally low (see Healthcare's Indefensible Administrative Costs). This suggests a major industry challenge in updating the electronic transactions and preparing for cutover to ICD-10. Systems changes will be required across the health system to accommodate the coordinated cutover of the electronic transactions. Then, on a single date for the industry, process and system changes will go into effect to support two code sets (ICD-9 for events before the date and ICD-10 after). Many systems will require iterative major upgrades to effectively support these requirements, each with full deployment to their customer base in fairly tight timeframes. This suggests a level of execution and capability that has only happened once before. That event was Y2K - - which caused one CEO to ruefully recount how he gave his CIO an unlimited budget, yet the CIO managed to exceed it. And which will now cause healthcare technology companies to ponder how they avoid a repeat of the sales collapse that immediately followed. On January 13, Barack Obama's nominee for Director of the Office of Management and Budget, Peter Orszag, testified that health care costs are a "principal driver of our long-term deficits". Orszag advocated for "expanding the use of health information technology (IT) and electronic medical records, which is a necessary, but not sufficient, measure to improving the quality and efficiency of the health care system". Orszag outlined other steps that can contribute to reductions in health care costs including research on comparative effectiveness of treatment options, incentives for "better care rather than more care", and incentives for prevention and healthy living. Orszag, a recent director of the Congressional Budget Office, is well respected in economic and political circles. His pronouncements regarding the impact of health information technology bring gravitas to this discussion. Rising costs for Medicare and Medicaid, in turn, reflect rising health care costs across the public and private sectors. Therefore, we need to be thinking about ways to slow overall health care cost growth, rather than just reducing the rate of growth in Medicare and Medicaid. Indeed, were we to try to slow Medicare and Medicaid spending alone without slowing the rate of growth in health care costs system-wide, we would simply create massive access problems for Medicare and Medicaid beneficiaries, since providers would be increasingly unwilling to serve those populations relative to others. Medicare and Medicaid policy changes can help to lead the way. But those changes will not be sustainable over time unless they also help to drive down cost growth in the rest of the system. Improving the efficiency of the health system, however, has benefits that extend well beyond the budget. Health care costs are already imposing severe burdens on state governments – on average, health care absorbs about a third of state budgets, even more than is taken up by education. Moreover, health care costs are reducing workers’ takehome pay to a degree that is both unnecessarily large and perhaps under-appreciated. There is a ray of hope. We appear to have massive opportunities to reduce health care costs without harming health outcomes. Significant evidence suggests that higher cost does not always mean higher-quality care. As I have noted before, perhaps the most compelling evidence of this fact is that per-capita health care spending varies widely across the United States, but the very substantial variation in cost per beneficiary is not correlated with overall health outcomes. Thus, embedded in the country’s fiscal challenge and the current burdens on state governments and workers are opportunities to reduce costs without impairing health outcomes overall. providing incentives for prevention (such as immunizations and screening tests) and healthy living (such as avoiding obesity and smoking) so that people have fewer health care problems throughout their lives." On January 9, 2009, an Institute of Medicine / National Research Council report (Computational Technology for Effective Health Care: Immediate Steps and Strategic Directions) reviewed use of healthcare information technology at a number of sites including Partners HealthCare, the University of Pittsburgh Medical Center, HCA Tristar, Intermountain Healthcare, the Palo Alto Medical Foundation, the University of California (San Francisco), Vanderbilt University Medical Center, San Francisco General Hospital, and the Veterans Administration. The report says in part that "the committee observed a number of success stories in the implementation of health care IT. But although seeing these successes was encouraging, they fall far short, even in the aggregate, of what is needed to support the IOM’s vision of quality health care. IT-related activities of health professionals observed by the committee in these institutions were rarely well integrated into clinical practice. Health care IT was rarely used to provide clinicians with evidence-based decision support and feedback; to support data-driven process improvement; or to link clinical care and research. Health care IT rarely provided an integrative view of patient data. Care providers spent a great deal of time in electronically documenting what they did for patients, but these providers often said that they were entering the information to comply with regulations or to defend against lawsuits, rather than because they expected someone to use it to improve clinical care. Health care IT implementation time lines were often measured in decades, and most systems were poorly or incompletely integrated into practice." "Although the use of health care IT is an integral element of health care in the 21st century, the current focus of the health care IT efforts that the committee observed is not sufficient to drive the kind of change in health care that is truly needed. The nation faces a health care IT chasm that is analogous to the quality chasm highlighted by the IOM over the past decade. So that the nation can cross the health care IT chasm, the committee advocates re-balancing the portfolio of investments in health care IT to place a greater emphasis on providing cognitive support for health care providers, patients, and family caregivers; observing proven principles for success in designing and implementing IT; and accelerating research related to health care in the computer and social sciences and in health/biomedical informatics." 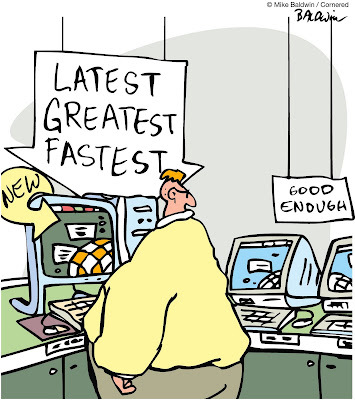 Link here for more on the "Good Enough" debate in Healthcare Technology. Are today's healthcare IT systems "good enough"? David Blumenthal (Harvard Medical School and Institute for Health Policy) said "the debate over whether existing technology is good enough has only emerged recently, with the prospect of a huge national investment in electronic health records. What seems to be happening ... is that passionate health technology advocates fear the country could get locked into an imperfect system." Healthcare technology interoperability is considered a key component to reduction of administrative costs and improved coordination and continuity of care. Mike Leavitt, Secretary of HHS, contends that "we're already on the road to a system that is universally accessible and secure. Health information experts ... have been working on foundational health IT standards and have made substantial progress." Support for seamless electronic interchange between providers and payers for administrative data flows. In 2009, several EHR vendors will support clinical summary exchange." Transition into product, and incentive systems for EHR adoption, has been accelerated through certifications including interoperability standards. Mark Leavitt, Chair of the Certification Commission for Healthcare Technology (CCHIT), recently reported on the existing certification programs, which started with an ambulatory EHR certification program launched in 2006. According to Mark Leavitt, CCHIT certified product are now required for a number of EHR incentive systems which have developed over the last two years, with total investments exceeding $700 million, including 44 distinct public and private EHR programs and "54 new EHR rollouts, representing 147 hospitals under Stark safe harbor rule." Around 46,000 physicians are eligible for, or have received assistance under these programs. Take time to parse the following from Mark Leavitt: "That there are no good products is absolutely not the problem". Secretary Mike Leavitt argues that that Obama's Recovery and Reinvestment Plan should require that investments in health IT systems be certified interoperable. This "could spur a critical mass of the nation's doctors to finally enter the information age... If we're going to build a 21st-century health infrastructure, we need to do it strategically, continuing the careful work on harmonized standards that will create one nationwide, interoperable system. That's the only way to make an investment in health IT produce value for providers and patients and improve the quality of health care overall." Not everyone is convinced that these investments will pay off. David Kibbe (Senior Advisor to the American Academy of Family Physicians) and Brian Klepper argue that "the easy solution would be to spend most of the health IT funds on EHRs. The EHR industry has made it easy by establishing a mechanism to 'certify' EHR products if they incorporate certain features and functions." Kibbe and Klepper contend that EHRs are expensive, disruptive to implement, with no clear patient safety benefits and are not yet interoperable. "These barriers to adoption are well documented; they form the wall that has kept physician EHR adoption overall to less than 25 percent in this country. Even if a hefty federal subsidy reduced the exorbitant cost of the EHRs, many practices would suffer severe negative business impacts, and primary care access could temporarily be reduced on a national scale." In the meantime, some healthcare organizations are waiting on the sidelines for the federal Recovery and Reinvestment Plan to be enacted before making new health IT investments. In Barack Obama's January 3rd radio address, he affirmed his intention to invest in healthcare technology as part of an American Recovery and Reinvestment Plan. His goal is to "make strategic investments that will serve as a down payment on our long-term economic future." He listed five areas of focus including renewable energy, infrastructure, healthcare technology, education and tax relief. "To save not only jobs, but money and lives, we will update and computerize our health care system to cut red tape, prevent medical mistakes, and help reduce health care costs by billions of dollars each year. " "As the holiday season comes to end, we are thankful for family and friends and all the blessings that make life worth living. But as we mark the beginning of a new year, we also know that America faces great and growing challenges – challenges that threaten our nation's economy and our dreams for the future. Nearly two million Americans have lost their jobs this past year – and millions more are working harder in jobs that pay less and come with fewer benefits. For too many families, this new year brings new unease and uncertainty as bills pile up, debts continue to mount and parents worry that their children won't have the same opportunities they had. However we got here, the problems we face today are not Democratic problems or Republican problems. The dreams of putting a child through college, or staying in your home, or retiring with dignity and security know no boundaries of party or ideology. These are America's problems, and we must come together as Americans to meet them with the urgency this moment demands. Economists from across the political spectrum agree that if we don't act swiftly and boldly, we could see a much deeper economic downturn that could lead to double digit unemployment and the American Dream slipping further and further out of reach. That's why we need an American Recovery and Reinvestment Plan that not only creates jobs in the short-term but spurs economic growth and competitiveness in the long-term. And this plan must be designed in a new way – we can't just fall into the old Washington habit of throwing money at the problem. We must make strategic investments that will serve as a down payment on our long-term economic future. We must demand vigorous oversight and strict accountability for achieving results. And we must restore fiscal responsibility and make the tough choices so that as the economy recovers, the deficit starts to come down. That is how we will achieve the number one goal of my plan – which is to create three million new jobs, more than eighty percent of them in the private sector. To put people back to work today and reduce our dependence on foreign oil tomorrow, we will double renewable energy production and renovate public buildings to make them more energy efficient. To build a 21st century economy, we must engage contractors across the nation to create jobs rebuilding our crumbling roads, bridges, and schools. To save not only jobs, but money and lives, we will update and computerize our health care system to cut red tape, prevent medical mistakes, and help reduce health care costs by billions of dollars each year. To make America, and our children, a success in this new global economy, we will build 21st century classrooms, labs, and libraries. And to put more money into the pockets of hardworking families, we will provide direct tax relief to 95 percent of American workers. I look forward to meeting next week in Washington with leaders from both parties to discuss this plan. I am optimistic that if we come together to seek solutions that advance not the interests of any party, or the agenda of any one group, but the aspirations of all Americans, then we will meet the challenges of our time just as previous generations have met the challenges of theirs. There is no reason we can't do this. We are a people of boundless industry and ingenuity. We are innovators and entrepreneurs and have the most dedicated and productive workers in the world. And we have always triumphed in moments of trial by drawing on that great American spirit – that perseverance, determination and unyielding commitment to opportunity on which our nation was founded. In this new year, let us resolve to do so once more. Thank you."